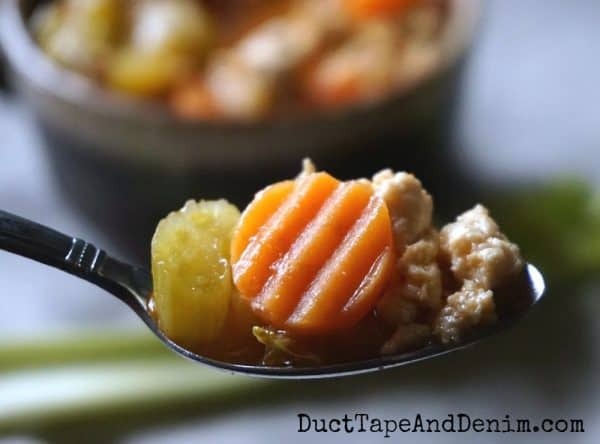 Spicy Buffalo Chicken Soup, an Easy Soup Recipe! You’ll notice my pictures are a little darker than usual today. Proof that it does get cold and rainy even here in California! Sunday afternoons are when I make my pot of soup for the week. And this chilly Sunday afternoon was full of football playoffs and just asking for spicy Buffalo chicken soup… could it be because we were watching the Buffalo Bills and I was thinking back to the time I ate Buffalo chicken soup IN Buffalo? Brown the ground chicken in a few tablespoons of olive oil with onion and garlic powder. Add the celery, carrots, chicken broth, and wing sauce. Bring to a boil, then simmer for 30 minutes. The soup is great at this point but I wanted it a little thicker. So I turned up the heat and mixed 1 teaspoon cornstarch with some water. When it was boiling lightly I stirred it into the soup. The heat level of this soup is just right for me. Feel free to add more wing sauce if you want it spicier. If you have any leftover Frank’s Buffalo wing sauce, try my Buffalo ranch dressing on a “Day After the Big Game” salad. My soup isn’t quite as yummy as the soup I had IN Buffalo but I’m sure it has fewer calories. BTW, my favorite way to eat this is to pour a few scoops over a baked potato! We join these blog parties. Featured on 25 Taste Winning Homemade Soups. I love buffalo anything! Thanks for sharing at the What’s for Dinner party! Thanks! I just joined your group. I have some other soup recipes on my FB page, too. Can I share those? Are there guidelines on how often I can post? Don’t worry, I don’t want to spam… just wonder if it’s once a day, once a week, or something else. But I’d love to share some of my popular recipes & crafts with your group. I like the idea of blending the flavors of buffalo chicken like this. 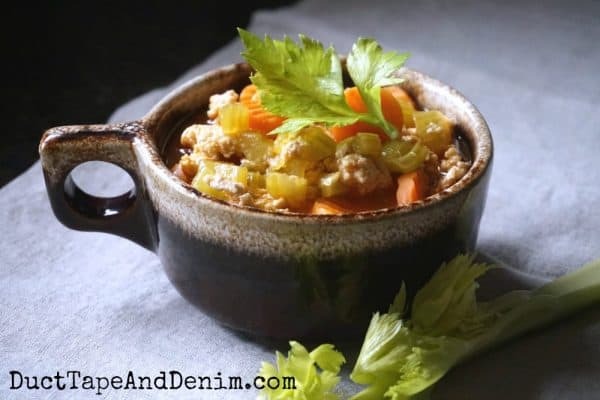 I think I’d try it with diced cooked chicken, since I haven’t done much with ground chicken (but maybe this is the perfect reason for me to try that!). Thank you for sharing this terrific idea. Awesome recipe, I love Frank’s Red Hot on most things. Thanks for sharing at Merry Monday, pinning! 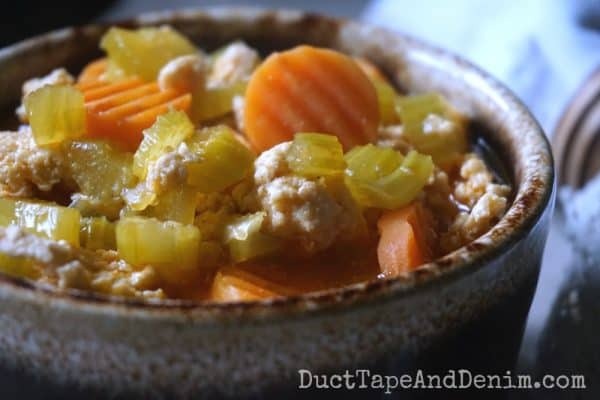 I love the Buffalo flavor for this awesome soup! Hope you are having a great day and thanks so much for sharing with us at Full Plate Thursday and come back to see us real soon! I love anything buffalo! A little spice is nice. : ) Thanks for sharing with SYC.